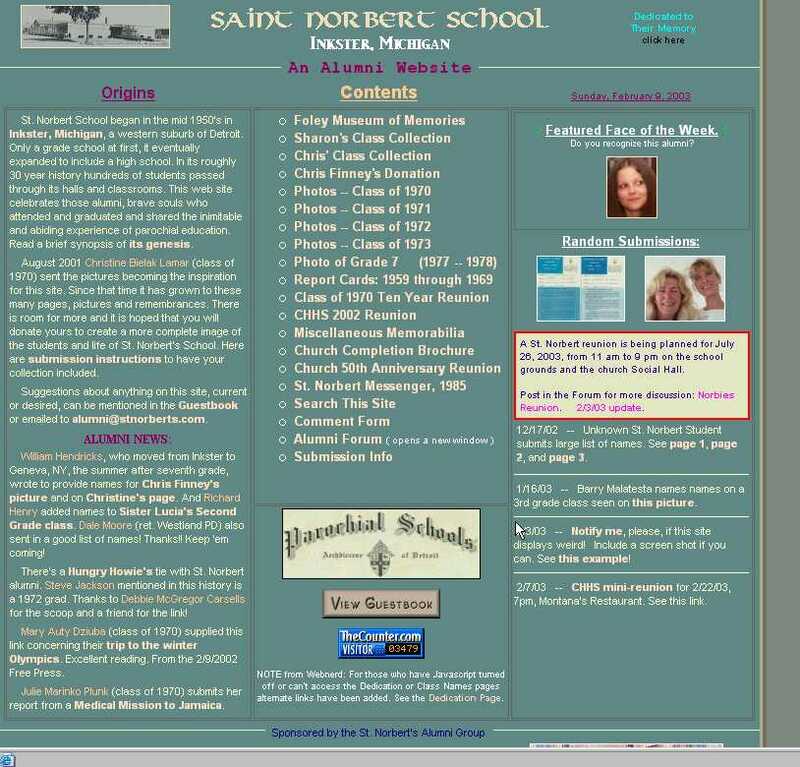 St. Norbert Grade School -- Finally Got Its Own Domain! I have heard a report that viewing the front page of this web site renders the page in a somewhat bizarre manner. Here's picture of one rendering dated 2/3/03. You can see that the page scrolls way to the right and still you don't see everything. This is a problem I am wrestling with. On the bright side it seems a remote occurrence, as only one individual has mentioned it to me. 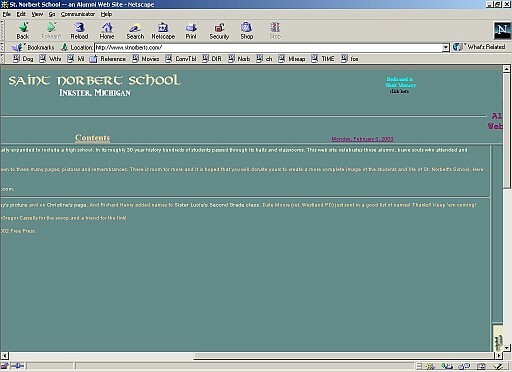 On the other hand, I don't know if few or many (though I suspect few) people are using browsers as old as Netscape 4.x. On the other hand how many might be seeing such deformed display and are just never coming back? Thus my dilemma. By the way, this is how it's supposed to look. 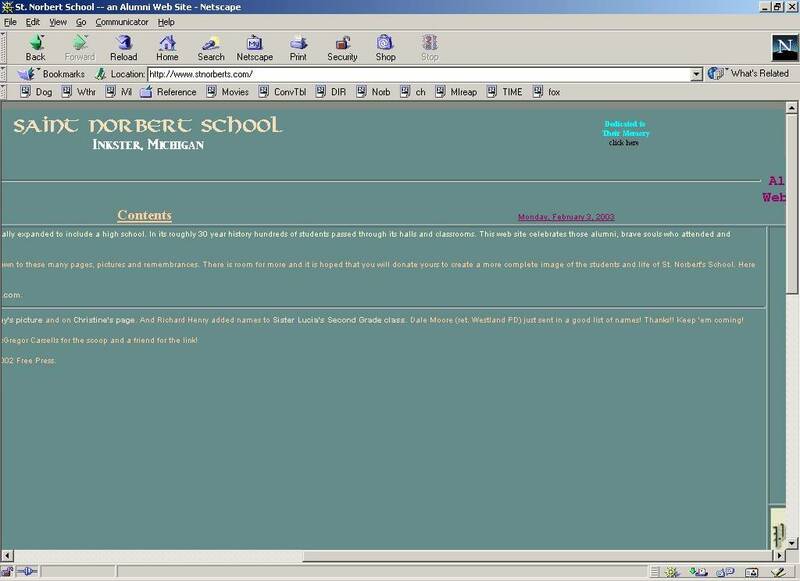 I first started out working on this web site in late August of 2001 when Christine Bielak-Lamar sent to me a bunch of old class photos. I designed a page that displayed in 100% of the browser window. Meaning no matter if one's monitor was set to display at 800 x 600 or 1024 x 768, the page would be displayed across the entire screen. This meant that all the elements on the page, the text, the table of contents, the pictures would float around to fit the dimensions of each monitor's resolution. The effect was that the appearance could be a tad jarring as pieces of the page wrapped wherever they had to. This hardly let itself to a uniform display of the page. Recently I changed the page to display at a rigid dimension based on the lowest reasonable screen resolution, that of 800 x 600. This is why the front page always has a predetermine width shown by the double border on the right of the screen. 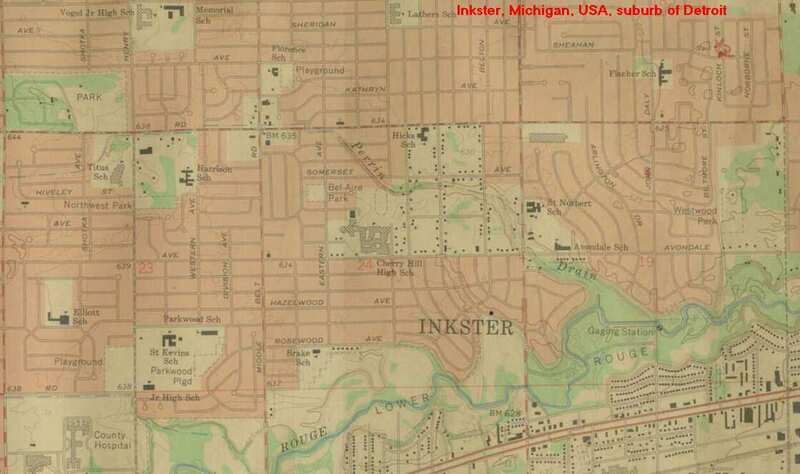 The page displays at almost 800 pixels wide. Now the page remains uniform in a multitude of resolutions and all the lines, pictures, and graphics stay where I have intended them. My own screen resolution at home and at work, on a 17 inch CRT monitor, is 1152 x 864. This size makes everything on the screen a bit smaller than at 800 x 600 or even 1024 x 7768, though I can get more on the screen, but everything is still quite readable. The down side of this seems to be that with the use of Cascading Style Sheets (CSS) to manage the page, some of the older browsers might not interpret the code as desired. Microsoft's Internet Explorer, for all of the companies popularly hated faults, is known to be quite fault tolerant to mistakes make by web author's in coding their pages. This generous forgiveness is bashed by some of Netscape's fans, as Netscape hates virtually any piece of sloppy coding. Personally I am committed to tight HTML, and scour pages I create for errors, things happen. Plus as mentioned before, older browsers weren't written for some newer coding devices like CSS. Thanks for any help you might render. John Schneider, class of 1970.